What a prelude to my Aurora Borealis hunting trip!!! In the middle of my flight from Seattle to Iceland, the captain spotted the Aurora Borealis or Northern Lights and announced that it could be viewed from the right side of the plane. Since I was seated on the left side, I rushed towards the right-side window by the exit door, but a few people were already in line taking pictures. I only had a quick glimpse before it disappeared. When I returned to my seat, I saw so much light outside, and I knew it was not coming from the plane. Then I saw shimmering curtains of light high up in the sky, coming from different directions. OMG Aurora Borealis! I tried to grab my big camera, but instead of wasting time trying to set it up, I decided to take a few snaps with my iPhone and just enjoy the Aurora in its full glory. Seeing it up close was really something special. I was like a kid on Christmas morning with the biggest smile on my face, looking through a foggy window and seeing Santa. It was magical. I arrived at Keflavik airport tired and hungry, but the prospect of seeing more Aurora Borealis and being able to take pictures of the amazing natural phenomenon gave me renewed energy. I met up with our guide and fellow Aurora hunters and stopped in Reykjavik for breakfast, orientation and lunch before heading to Hella, a countryside in South Iceland, where we were scheduled to spend two nights to go hunting for the Northern Lights. “Yao (já), the sky is so clear. What a beautiful day. You’re very lucky to have this kind of weather,” said our guide. She looked into her smartphone and announced that it was 6 degrees Celsius, and mumbled in Icelandic to translate the temperature into Fahrenheit. “It’s 43 degrees, very warm, unusually warm at this time of the year for Iceland,” and mentioned something about global warming. I then realized why our guide was excited about the cloudless sky. It’s one of the conditions to be able to view the Aurora Borealis. Another condition is to have darkness. That’s why we were headed into the countryside to get away from the lights of the city of Reykjavik. And of course, our guide explained the most important condition: the solar activity. The Aurora Borealis is activated by collisions of electrically charged particles from the sun, caused by flares on the sun’s surface that enter the earth’s atmosphere. The strength of the Aurora Borealis depends on the power of the solar flares and the angle relative to the earth’s atmosphere. It’s measured in KP (a scale of numbers between 0 and 9 of the planetary index). The higher the KP number, the greater possibility of seeing the Aurora. The KP at the time was 4, a very good indication to see the aurora, but could change anytime. We stopped at a Geothermal Plant before continuing the drive through Route 1, a two-lane highway with a flat, scenic landscape with lava rocks and volcanoes on the right side. After the geothermal plant, the lava rocks started to grow green mosses. It took us an hour and a half to get to Hella and arrive in time for the happy hour and dinner. After a delicious dinner at the hotel, I went back to my room to set up my big camera and download a Northern Lights app on my iPhone. It was 9:00 pm when our guide told us to go outside and check out the Aurora. As I stepped out of the hotel I saw shimmering lights up in the sky. 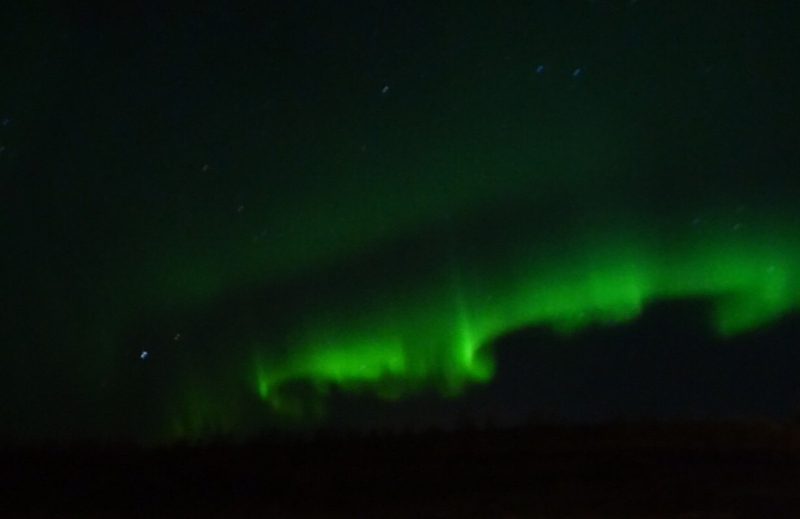 We walked up the hill, about 800 feet away from the hotel, hoping to see an unobstructed view of the Aurora. But it was like this crazy quick glimpse that did not last long. Everybody had their camera ready and waited in the quiet of the night and in the cold for hours for the Aurora Borealis to reappear. Everyone was tired and started going back to the hotel. I was one of the last ones to stay but did not wait long enough for the Aurora to appear. It’s a good thing that I signed up for the Aurora Borealis wake up call. At midnight I was awakened by a faint phone ring. The phone only rang once, so I almost ignored it. A few minutes later, I heard what sounded like a real wake-up call. So, I ran outside and saw glimmering strips across the sky. It was surreal as if I was walking on a dream. I started taking pictures using my iPhone, but the Aurora Borealis was hard to capture in a photo. I was disappointed that I was not able to get good pictures, but very happy to see this incredible natural phenomenon with my own eyes. Four nights later, we were outside Reykjavik, in the middle of nowhere hunting for Aurora again. We had a new guide who fed us lots of information like the scientific explanation that went way over my head, myths and legends about the Aurora, and about Iceland. She mentioned that patience was another condition for viewing the Aurora Borealis. I also came more prepared with the warmest clothing and brought a thermos filled with hot coffee. Our bus was parked by the lakeside, surrounded by darkness except for the shimmering reflection of the half-moonlight on the lake. The beauty of the moonlight reflection, the milky way, and the stars was a great diversion while waiting for the Aurora Borealis to appear. I took a few snapshots of the moon’s reflection on the lake using my Sony RX10 camera. But as I learned from the first night of Aurora hunting, the Aurora Borealis was hard to capture in a photo, especially without a tripod. So, I went back inside the bus to put my camera away. We waited in the cold and darkness for more than two hours with no Aurora in sight. I thought I would not be totally disappointed even if I didn’t get to see the Aurora that night for I already saw it during my flight to Iceland and in Hella. I went on the bus to have a sip of coffee when suddenly I heard voices of excitement. I looked opposite the moonlight and saw dancing lights in the shape of a bow. It was elusive, but what a beautiful finish to a magical night!